VANCOUVER, May 29, 2018 /CNW/ - Bluebird Battery Metals Inc. (TSXV: BATT; US:BBBMF) (the "Company" or "Bluebird") is pleased to announce that initial exploration has commenced at its Canegrass Ni-Co-Cu Project (the "Project") in the Mount Magnet Region of Western Australia. After acquiring property in March 2018, ground EM surveys were initiated in April 2018 at two priority targets (CG02 and CG039), where the previous drilling identified nickel, cobalt and copper close to surface. 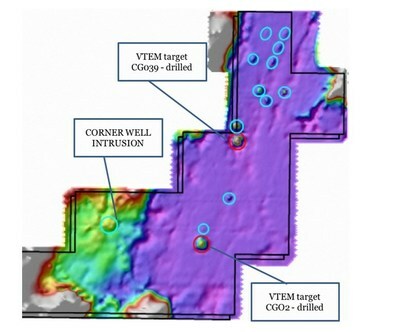 Preliminary interpretation of the results by Newexco, the Company's lead geophysical contractor, positively identified the presence of strong EM conductors at both targets. Ground EM survey program expanded across the multiple other conductors identified in 2013. Expanded airborne mag survey to commence before the end of May 2018. Currently reviewing drill permits to ensure the Company can test new priority targets in early Q3, 2018. "We are pleased to commence our initial exploration program on our priority nickel, cobalt, copper project within the largest layered intrusive complex in Australia. Previous exploration, not followed up on since 2014, highlighted exciting nickel and cobalt grades close to surface that clearly deserve attention noting the recent increase in cobalt and nickel commodity prices," commented Peter A. Ball., Chairman and CEO of Bluebird. "The interest in the Battery Metals Sector has surged in the past year, noting the exponential demand for Cobalt related to the Electric Vehicle revolution, and the supply gap that is foreseen in the next few years. BlueBird recently acquired two exciting (Ni-Co-Cu / Co-Cu) projects, and continues to review other potential opportunities to add to our portfolio." The underexplored 4200 hectare Canegrass Ni-Co-Cu Project, is located ~60 kms SE of Mt. Magnet in Western Australia. 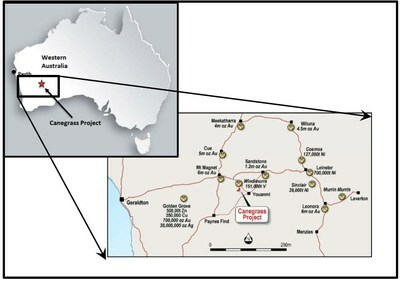 The Project is located within the Windimurra Igneous Complex ("Windimurra"), the largest layered mafic-ultramafic intrusive in Australia (see Figure 1), thickest in the world, and geologically similar to the Bushveld Igneous Complex in South Africa. In 2013, an airborne VTEM ™ survey identified fourteen (14) conductors within the 4,200 ha property footprint (see Figure 2), six of which are associated with coincident magnetic anomalies. 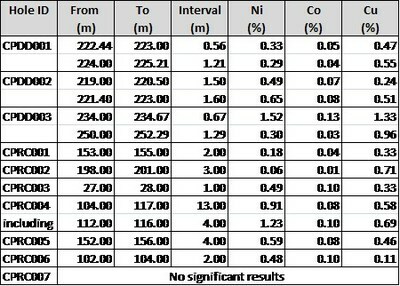 Initial diamond drilling (10 holes) was completed in 2014 at two of the fourteen identified conductors, and intersected nickel, cobalt and copper in nine of the ten holes drilled (see Table 1). Hole CPRC004 intersected 13.0 m grading 0.91% Ni, 0.08% Co and 0.58% Cu, the most significant result to date. Downhole EM surveys completed in 2014 identified off-hole anomalies that were never followed up or drilled. Recommendations from the initial exploration included follow up ground EM surveys over the identified conductors and a high resolution airborne magnetic survey over the entire property. After acquiring the project in March 2018, and reviewing the historical data, BlueBird's technical team immediately initiated ground EM surveys in April 2018 at two priority targets (CG02 and CG039), where the previous drilling identified nickel, cobalt and copper close to surface. Preliminary interpretation of the results by Newexco, the Company's lead geophysical contractor, positively identified the presence of strong EM conductors at both targets. As a result, the Company has decided to expand the ground EM survey program across the remaining conductors identified in 2013. Based on additional technical review of the project, the Company is also further expanding a recommended airborne mag survey, to commence before the end of May 2018. BlueBird will expedite the analysis of results from the airborne and ground based surveys, and accelerate permitting and a drill targeting exercise to ensure the Company can test the priority targets by means of reverse circulation drilling in early Q3, 2018. The Company entered into an option agreement with Trafalgar Resources Pty Ltd., a private Australian company, to acquire a 100% interest in the Canegrass Project (refer to BlueBird's press release dated March 15, 2018). Sample #2 was very similar metal ratios as Windy Craggy. The technical content of this news release has been reviewed and approved Wes Hanson, P.Geo., a director of the Company and a Qualified Person pursuant to National Instrument 43-101. The qualified person has not yet visited the Canegrass or Batt Projects, and therefore has not yet verified the data disclosed, including sampling, analytical, and test data underlying the information or opinions contained in the written disclosure. BlueBird Battery Metals (TSXV: BATT; US: BBBMF) is a Canadian publicly listed company focused on the global exploration and development of strategic battery metals projects, primarily cobalt and nickel. BlueBird's goal is to pursue a business model that offers direct and long-term leverage to the price appreciation in nickel and cobalt, two principal materials in EV batteries. The Company plans to become a leader in the battery metals sector, as cobalt is currently in a global supply deficit, has a vulnerable supply chain, and is part of an emerging sector with extraordinary potential. BlueBird is currently advancing its Co-Ni-Cu projects in Western Australia and in Yukon, Canada, and reviewing new acquisition opportunities to add to the Company's portfolio. This news release may contain or refer to forward-looking information based on current expectations, including, but not limited to exploring the Canegrass Ni-Co-Cu Property and the Batt Co-Cu Property and the impact on the Company of these events, including the effect on the share prices. Forward-looking information is subject to significant risks and uncertainties, as actual results may differ materially from forecasted results. Forward-looking information is provided as of the date hereof and we assume no responsibility to update or revise such information to reflect new events or circumstances.